Why him? I thought you were talking about Adywan? I’m no audio geek. Putting over a scene that wasn’t there originally is basically the limit of my abilities. But out of curiosity, what would separating channels do? A fanedit of the final two films in the 8-part Harry Potter saga that condenses Parts 1&2 into a more streamlined, action-packed, epic finale to The Boy Who Lived’s emotional journey. Try to add in the black suit for Superman and try to repurpose dialogue from the Justice League Unlimited Darkside, maybe use footage from Injustice or Young Justice as a sort of pre-beginning monologue where he states his dire plans for earth. Thank you, brother! Greatly appreciated! Yes, PoA and HBP are next. They are both being worked on and have come a fair bit of way. Thought I’d take a break from my Batman Forever Noir edit to talk about my idea for a Justice League re-edit. It’s called Justice League: World Without Hope. The basic premise: Superman is the symbol of hope. And a world without Superman is a world without hope. The main goal for this edit is a simple one: darken and serious-ify (Thanks, Dixon!) the film to fit the characterisation entablished in Man of Steel and Batman v Superman: Dawn of Justice, thus making it a worthy end to the Zack Snyder trilogy. What an interesting thread. I am aware this workprint includes the original shot of Alec being shot in the head during the prologue. they had to trim that shot because the MPAA would have given Goldeneye an R Rating. Screw the MPAA!!! This also happened with the Decompression Chamber Scene in License To Kill upon it’s release in 1989 , but fortunately it was restored on the Ultimate Edition DVD and the BD!! I know how you feel, mate. Consider this my last & final take on BF just until the official Director’s Cut gets green lited & released then i’ll come back & re-do everything with the new footage. 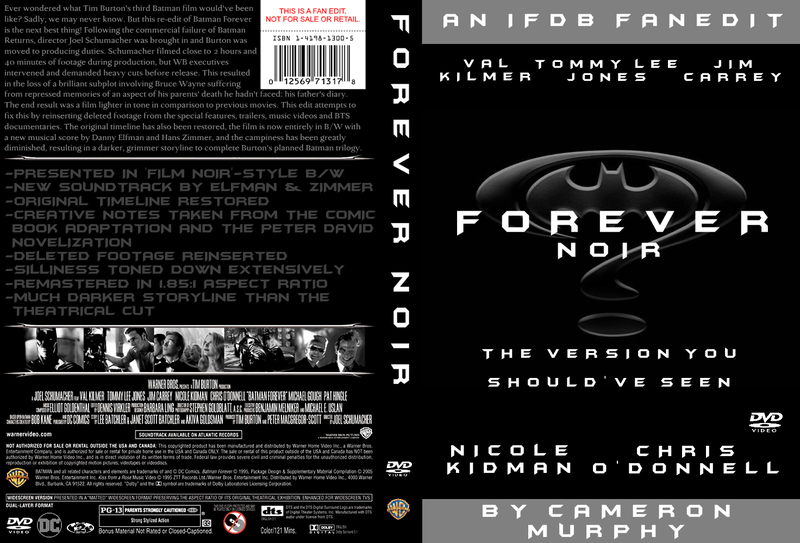 The Official Forever Noir Thread! Have you released it in full yet? password for viewing the clips ? looks very interesting , and I like how you are toning down the character of Two Face . They made him seem too much like the Joker in the theatrical release and the character was never meant to be that goofy .